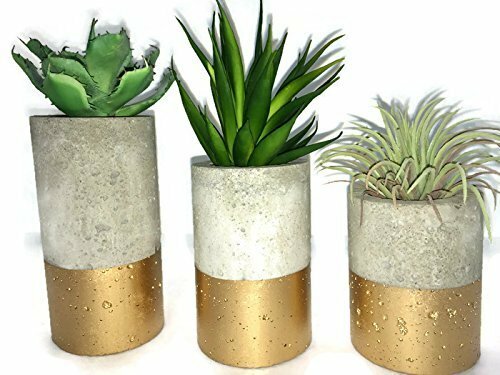 These concrete planters are designed for succulents, air plants, tea lights etc. Each one is hand made and hand colored.. Includes set of (3) planters. One of each (4", 5",6" tall). 3" diameter. Cavity is 2" wide x 2" deep. Succulents not included. 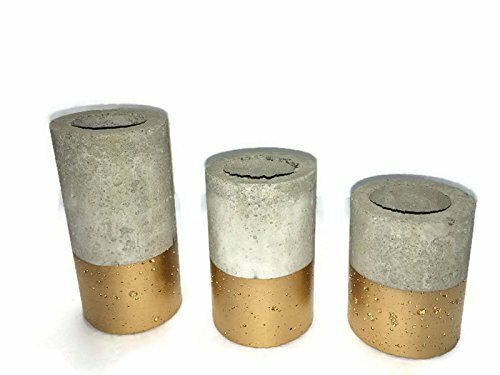 Dominant colors are gold, natural concrete gray.They do not have drainage holes but if you would like drainage holes added I would be more than happy to make you a set that does. Just include it as a message when placing your order. Ships within 1-3 biz days USPS. But I usually get them out within hours of purchase. Thanks for stopping by, Hope you find what you're looking for!